New Delhi: Recovering from an ankle injury, defending champion Sourabh Verma has decided to pull out of the Senior National championships to regain his match fitness for the upcoming tournaments. The 24-year-old, who last participated at the Japan Open Superseries in September, had suffered an ankle injury during training at Hyderabad and decided to skip Denmark Open and French Open. "I am not playing at the Nationals as I am still not in the best shape to play. I had injured my ankle during training after the Japan Open and have started on-court training just this week," Sourabh, who had won the Senior Nationals in 2011 and 2016, told PTI. "I had issues in my ankle but it had aggravated during the training so I decided to take rest for a couple of weeks." Verma, who had clinched the Chinese Taipei Masters and finished runners-up at Bitburger Open last year, will make a come back at the China Open Superseries Premier, which starts on 14 November. "I will be playing at China and Hong Kong next. I had an off and on year, so not thinking too much right now. Just want to play and see how it goes," said the World No 41, who will take on France's Brice Leverdez in the first round at China. Talking about the training sessions, Sourabh said: "It is helping all the players, we are getting good results. There are long sessions. "I was doing some specific off-court training as I was not allowed to play on court due to my injury. So I was doing rehabs and now I have started normal training with Mulyo sir," said Sourabh, who had lost a close match against legendary Lin Dan in the opening match at Japan. 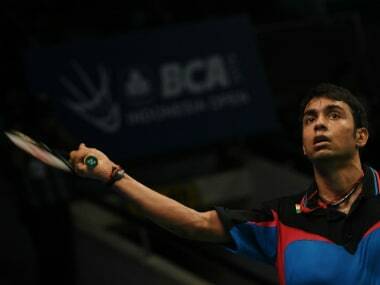 Sourabh had reached the quarter-final at the Syed Modi International and New Zealand Grand Prix Golds but he could not get past the pre-quarterfinals in the five Superseries that he played this year. Almost all the top Indian shuttlers, including Kidambi Srikanth, HS Prannoy, PV Sindhu and Saina Nehwal, will be seen in action in the Senior National Badminton Championships, beginning in Nagpur on Saturday.